On this day, 16 August, 191 years ago (1819), a peaceful rally of around 60,000 pro-democracy reformers gathered at St Peter’s Fields in Manchester. The crowd of men, women and children were charged by sabre-wielding cavalry, resulting in 15 deaths and 600 injuries. 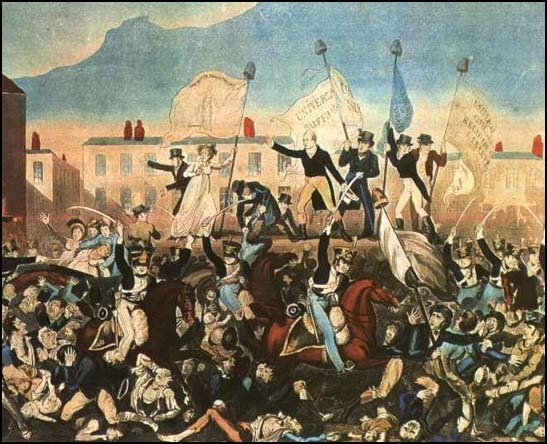 The horrific event is known as the Peterloo Massacre: a macabre, ironic inversion of the heroism of the Battle of Waterloo, met four years earlier, the shame of Peterloo. After the end of the Napoleonic Wars, Britain was in a financial crisis. There were food shortages, wages were slashed and there was massive unemployment. Many British soldiers and sailors returned home to nothing after years of arduous campaign. The food shortages led to increased import of foreign crops, which drove the price of British cereals down. The government’s response was to introduce the first Corn Law, controlling and curtailing the import of crops. This helped keep the price of British cereals artificially high, but severely exacerbated the food shortage. In Parliament, it was argued that steady prices for British crops would protect the wages of agricultural labourers, a rather flimsy excuse for keeping landowners’ incomes high. Parliament was considered out of touch, elected by a severely antiquated system. Lancashire as a whole, including the great industrial city of Manchester with its surrounding townships, elected two MPs. However, only those who owned land could vote, and they had to travel to Lancaster to cast their vote by public acclamation. In contrast, there were a handful of ‘rotten boroughs’ in which a handful of electors elected two MPs. Reform was clearly needed, yet the ruling class feared the radicalism seen in the French Revolution, and entrenched against it. Categories: politics | Tags: 16 August, 1819, Britain, cavalry, Corn Laws, food, food shortage, French Revolution, Gandhi, Guardian, Ian Tomlinson, landowners, Liberty Cap, Manchester, massacre, Napoleonic Wars, Parliament, Percy Bysshe Shelley, Peterloo, Peterloo Massacre, Phrygian cap, police, Prince Regent, radical, radicalism, radicals, reform, sabre, Six Acts, The Masque of Anarchy, unemployment, wages, Waterloo, yeomanry | Permalink.